The Pacific halibut is one of the most popular North American fish. The largest of the flatfish, Pacific halibut can reach lengths of 8 feet or more and weigh up to 600 lbs. Halibut have a flat body with eyes on the right side. The skin on the top side is mottled to blend into the ocean floor and can be olive green, brown, or almost black in color. The underside is snow white. 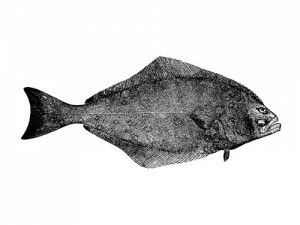 The meat of Pacific halibut is white, mild and flaky. Its thickness lends itself to a variety of recipes including grilling, baking and broiling.